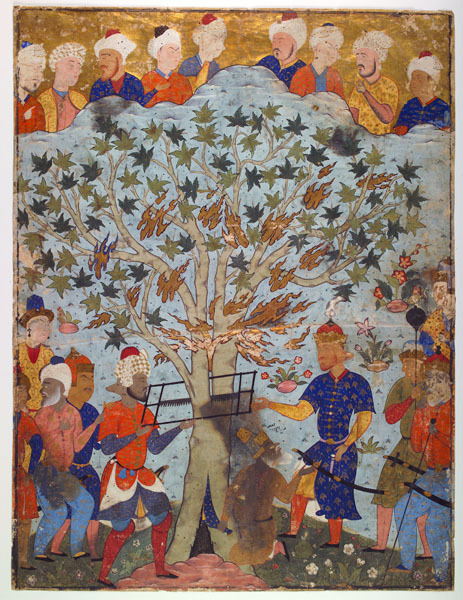 This painting is one of twenty-nine known pages from a dispersed manuscript of the Falnama, which has been dated to the reign of Shah Tahmasp and attributed to Aqa Mirak and Abd al-Aziz, artists at his court. The manuscript was extraordinarily large. Its miniatures depict episodes from the lives of the Old Testament prophets, Jesus, and Muhammad and his family, as well as scenes of heaven and hell. No text appears on the paintings, but inscriptions on the back of each include poetic references to the prophets and forecast the future of the person who is using the book. In this case the writing on the reverse refers to the miraj, or night ascent of the prophet Muhammad, and lists divinations said to derive from commentaries of the Greek physician Galen. 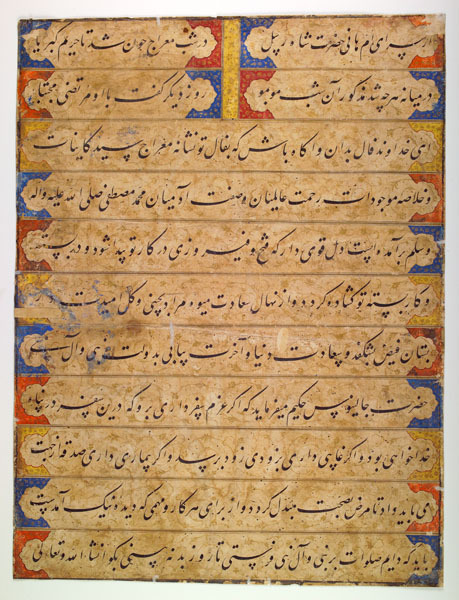 A depiction of the miraj (now in the Arthur M. Sackler Gallery, Washington, D.C.) faced this text. Illustrated here is the story of the prophet Zakariya (a conflation of Zacharias, the father of John the Baptist, and the Old Testament prophet Zachariah), who according to Muslim legend died a martyr's death. Escaping his pursuers by hiding in a tree that miraculously opened to admit him, Zakariya was betrayed by Iblis, the devil, who pointed out the hem of the prophet's cloak protruding from the trunk. The devil's forces sawed the tree apart and with it Zakariya, whose saintly aura is shown as flames bursting among the leaves.